Divine Divas Inspiration Challenge #20! 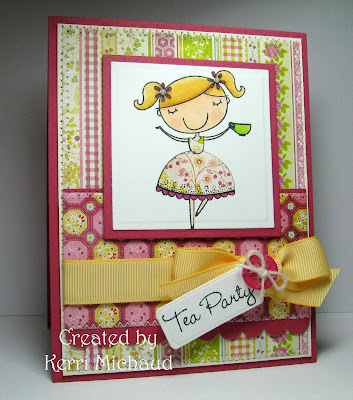 Ohhhh that BasicGrey Lemonade patterned paper goes perfect with the little teacups in the picture. And I love her paper pieced dress - - that is fantastic! Kerri, what a darling card! How inspired!!! I love that sweet little image with her pieced dress. 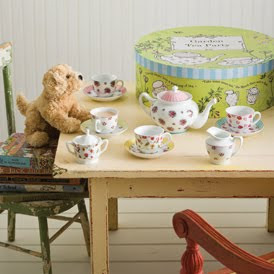 she's having a teaparty all by herslf!! Great job!! What a fun card with such a sweet image. Love your paper piecing!! What a creative take on the inspiration. The paper is so pretty and such an awesome design. OMGosh! This is just adorable...I love it! This is just wonderful - I love those papers and they are perfect for the challenge. The paper piecing and beautiful bow are so gorgeous! Just a stunning card! What a cutie, Kerri! Love the soft colors and wonderful dp. Your little tea partier is so cute and I love the ribbon/sentiment treatment. You are one of the few people that I believe can justify me saying that card making is an art. This is lovely!!! What a sweet inspiration picture! And what a sweet card! Love how you paper pierced this girl dress! O so cute Kerri! Love her paper pieced dress and the layout is superb! Love it!